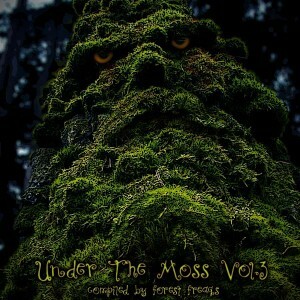 The legendary Forest Freaks return with Under The Moss Vol. 3, the latest in a series of compilations showcasing the very finest in Lithuanian forest music. As with Under The Moss Vol. 1 and Under The Moss Vol. 2, this stellar release offers a rare glimpse into a secret world of forest spirits and fairy creatures, always with a strong focus on quality. Mastering and artwork by Forest Freaks. MP3 Download | FLAC Download | WAV Download · Download count: 17,240. Awesome!! Yay another Under the Moss. One of my favorite forest styles, these guys are good! Glad to have them back again, showcasing all the talent. Shizoid Bears.. C Monster.. DoHM… yeah!!!! Ive been waiting a long time for Under the Moss to return, Great release and keep em coming! OMG OMG OMG niiiiice one !!! Vive Under the Moss ! thousands of kisses from France ! YEAH !! The return of Under The Moss.. probably the best forest compilation out there. One of my favorite series of VA on Ektoplazm!! And this one is the best so far IMO. Congrats & thanks to all involved! Amazing stuff. Thanks for another awesome release. The artwork is just adorable. WOwowowoowoWOWOWO!!!!!!!!!!!!!! tnx!!!! aguante anderdemos ameeegooo!! Anyone know what’s the song that begins the track Ypsilon from P.Tale? Thanks! Awesome Release!!!!! thx to the northern forests!!!! Thank You people for a positive feedback . Faithfully yours, Freaks from Lithuania. This might be the best compilation I’ve heard in my whole life. Just gets BETTER!!!! Thank you! :o yessssss, I have been patiently waiting. Thanks a lot folks, goin straight into my forrest playlist. Like the last comment, I hope there will be another ‘Under the Moss.’ Please do not hesitate to contact me with any comments. The link to the video is below. Thank you.